Today on 2nd June 2014 India’s 29th state is born and without any surprise the new born Telangana is just like the rest of the states in the Republic of India. Lots of beautiful places & sites can enthrall you while you travel to Telangana. It has variety of places with rich cultures & history and I on behalf of Shanti Travel would like to list down the top 10 places to visit in Telangana. Charminar– This 400 year old monument embodies the history, beauty & cultural heritage of the spectacular city of Hyderabad. Built in 1591 CE, it is one of the most recognized structures of India. 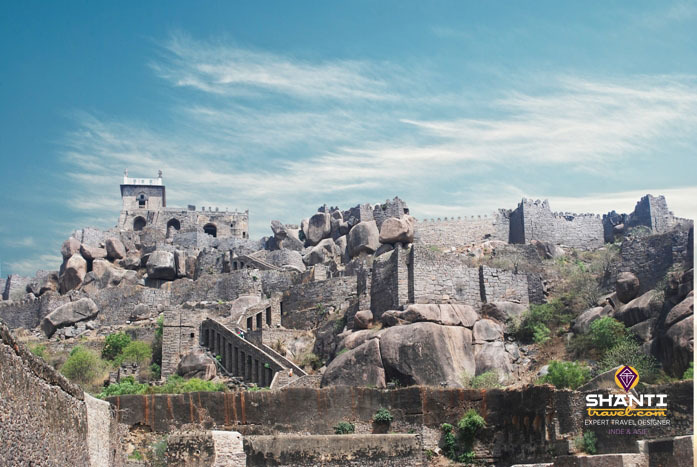 Golconda Fort– A magnificent example of Kakatiyan Architecture, Golconda fort (Shepherd’s Hill in English) is a ruined fort situated 11 km from Hyderabad. The Fort is also universally famed for the fact that it housed famous and coveted gems like Kohinoor Diamond & Hope Diamond. 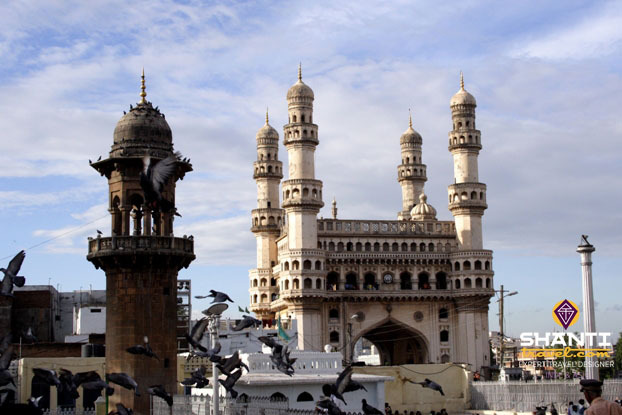 Mecca Masjid – One of the oldest mosques in the Nizam’s city of Hyderabad, it is also considered as one of the largest mosques in India, which can accommodate 10000 people at a time. This mosque got its name from the holiest site of Islam because the bricks which were used to build the central arch of the mosque are made from the soil brought from Mecca. Salar Jung Museum – It is an Art Museum located in Hyderabad and it is one of the three National Museums of India. It houses the precious one man collections of antiques in the world and the museum is named after the proud collector Nawab Mir Yusuf Ali Khan Salar Jung III himself. If you are an art lover and want to go back into the history of artifacts then Salar Jung Museum is the place to be. The Ramoji Film City – It is a massive film city spread across 1666 acres of land in Hyderabad and is also the largest integrated film city in the world. With awesome sets and film making infrastructure it is considered as a filmmaker’s paradise. A must go place for those who just love movies. Medak Church – Situated in Medak which is around 96 km from the city of Hyderabad, it is the finest example of Gothic Architecture in India. The Medak church is the single largest diocese in Asia and second largest in the world after Vatican. Mallaram Forest – Located in the verdant surroundings of the Nizamabad district in Telangana, Mallaram Forest is a perfect place for eco tourism. For adventure lovers, a trek in the Mallaram forest is something you should look forward to. Gnana Saraswati Temple – Situated on the banks of picturesqueGodavari River in Basar, Adilabad, it is a Hindu temple of Goddess Saraswati (Hindu Goddess of Knowledge, Music, arts & wisdom) and is also the one of the two Saraswati Temples in India with the other being at Jammu & Kashmir. Ramappa Temple – Located at 77 km from Warangal, Telangana at the ancient capital city of the Kakatiya Dynasty, Ramappa Temple is a Medieval era temple of Lord Shiva. It is also known as Ramalingeswara Temple and it is the only temple in the world which is named after the sculptor of the temple. It took 40 years to build the temple and believe it or not the roof of the temple is built with bricks so light that it can float on water. Thousand Pillar Temple – Another Kakatiya architectural marvel, the Thousand Pillar Temple is a historic Hindu temple located in the town of Hanamakonda, Warangal. The temple is dedicated to Lord Shiva, Lord Vishnu & Lord Surya (Sun) and has 1000 pillars to support the entire Temple. So these are the 10 must go places to travel in Telangana. If you want to add some more to this list then please feel free to post a comment on the blog and we will definitely respect your love for Telangana by adding the location you will mention.